National Small Business Week is a time when we recognize the enormous contributions of small businesses and celebrate their successes. This year, Google and partnering organizations are taking it one step further and encouraging everyone—citizens, communities and business owners themselves—to come together and give small businesses the help they need to succeed. Small businesses account for 99.7% of employer firms in the US (SBA 2014), which means when small businesses succeed, everyone benefits. Stronger businesses build stronger communities and we can all help to make sure those businesses are set up for success. But many small businesses are lagging behind when it comes to their online presence. 4 in 5 consumers use search engines to find local information nearby like store address, business hours, product availability and directions (Google/Ipsos 2014), yet only 37% of businesses have claimed a local business listing on a search engine (Marketing Sherpa 2012). Evaluate their online presence. Use the Check My Business tool to make sure your favorite local businesses are showing up online. This tool shows how a small business’s hours, location and more show up on Google Search and Maps. Join a free workshop and invite a friend. 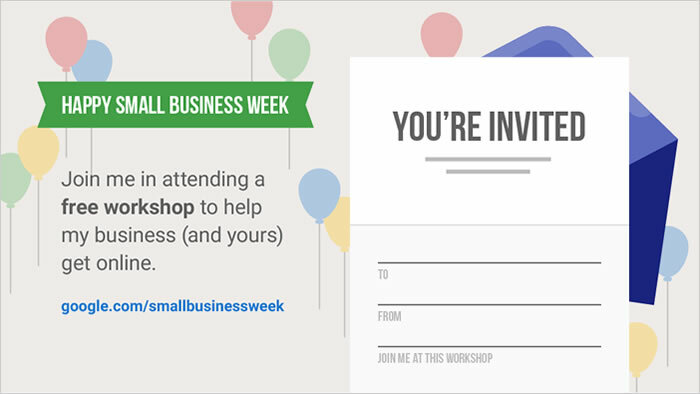 Google is teaming up with organizations in local communities to host free workshops during National Small Business Week (May 1-7). The workshops will cover a variety of topics, from getting on Google to building a website to setting up a custom email address. Find a workshop near you and RSVP. Share your story. If you’ve helped a fellow small business owner, share your story on social media using #AllForSmallBiz. 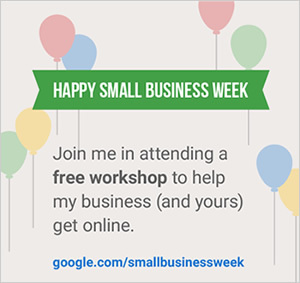 We’ll be looking for great examples of businesses helping each other in the spirit of Small Business Week.